Arizona Snowbowl began desecrating sacred San Francisco Peaks with snow made from sewage water on Tuesday, over the protests and court actions of Native Americans. San Francisco Peaks are sacred to 13 area Native American Nations and a place where medicine men conduct healing ceremonies and gather healing herbs. 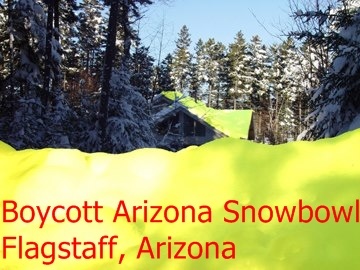 An international boycott is urged of the Arizona Snowbowl and shopping in the City of Flagstaff, Arizona, as both have pushed to make sacred San Francisco Peaks a playground for fools. Instead of upholding the cultures of Native Americans, which are displayed and exploited throughout the city of Flagstaff, the city has pushed for this desecration and the financial profiteering for the Scottsdale businessman who owns it. The media, too, has played a role in this desecration, including the Arizona Daily Sun, which refused to report in an ethical manner the widespread protests and court actions against the sewage water for snow plan. There was also widespread destruction of the old growth forest for the pipeline. Christina Sekayumptewa, Hopi from Hotevilla, said, "One day very soon all the kachinas will come and whip them for all these violations against nature." In Flagstaff, KTAR FM reported, and promoted, the news that the Arizona Snowbowl began using the snow making equipment on Tuesday. Pres. Obama promotes the TransCanada Stillwater Pipe Yard near Cushing, Okla., March 22, 2012, as Native Americans protestedare prevented from entering the area. Meanwhile, on Wednesday morning in Nacogdoches, Texas, TransCanada is bulldozing a renewable biofuels farm. TransCanada is seizing the land for the dirty tarsands pipeline. 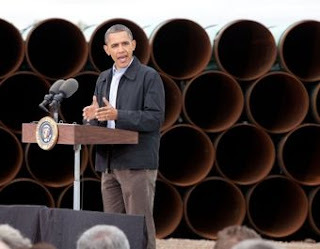 It is the same pipeline that Obama came to Cushing, Okla., to promote in March. Native Americans protesting the event were prevented from entering the area. TransCanada is terrorizing the poor and elderly family farm owners in northwest Texas at this moment. The tarsands mining has already annihilated the homeland of the Cree in Alberta, Canada. Tiokasin Ghosthorse, Cheyenne River Lakota host of First Voices Indigenous Radio, shared his thoughts on surviving and the natural law of honoring the earth. "Mother Earth will decide our course and the possibility of you surviving depends on whether you continue to think you are immune to her. Extraordinary natural earth movements define Indigenous peoples as human beings as long as we respect those natural processes, but it is the disrespect, arrogance, and callousness that people define Mother Earth as an economic commodity," Ghosthorse said. "Mother Earth will not obey any human made laws. The longer modern humans ignore the wisdom of ancient earth cultures and think of it as dead, useless and no longer in need of respect the more difficult it will be to recover from its own modern-day demise. When this happens, she will begin to hide her ancient wisdom and the Indigenous peoples will no longer offer our knowledge of how to live with Mother Earth, and as long as archaic hierarchical religions and government jingoisms persist we will always be thought of as the wretched of the earth’s wisdom - because by then it will be too late. "This may be a sobering realization; it is also one of your best defenses of survival." On Navajoland, Dine' continue to die from radiation from Cold War uranium, as new uranium mining is pushed. Battling new uranium mining, Don Yellowman, Dine' said, "Our Navajo Nation supports dirty energy production, which pollutes our air, water and homelands; and ironically we who live in Western Navajo, have been denied electricity and access to potable water because of those outside interests and policies that impede our right to prosper, like the Bennett Freeze." In the western region of Navajoland, many Navajos live without running water and electricity. It is this same area that is now targeted by Interior Ken Salazar, in a scheme with Senator Jon Kyl, to push legislation through a lame duck Congress to steal Navajo water rights. The scheme was made public by a leaked e-mail. Navajos have already said "No!" to this water rights theft scheme of the Little Colorado River. Arizona is desperate for this water to continue lavish lifestyles of water waste in the desert, and to provide water for the dirty coal fired power plant, Navajo Generating Station, which provides electricity for the Southwest. It is one of the dirtiest coal fired power plants in the US and operated by the Salt River Project. 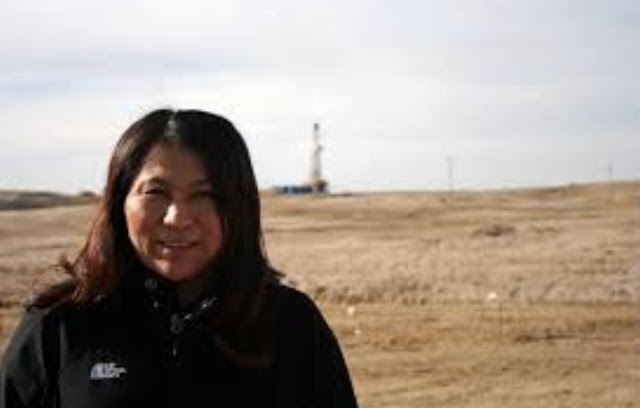 In North Dakota, oil and gas drilling has devastated the homelands of the Mandan, Hidatsa and Arikara. In what is now being called "blood money," elected Native American politicians have pushed for the drilling under the guise of economic development. Lakotas fight uranium mining in their homelands, as a natural liquefied gas pipeline threatens the pristine region of the Columbia River at the Oregon and Washington border. Native Americans in Alaska fight the oil and gas drilling that is destroying the habitat of the beluga whales and polar bears, as Gwich'in struggle to protect the birthing place of the caribou. Gwich'in Sarah James said, "The Gwich'in are caribou people. Caribou has provided for us since the beginning of time." "Just as we rely on caribou, the caribou depend on the Arctic National Wildlife Refuge Coastal Plain. This is the birthplace and nursery grounds, where every Porcupine caribou calf gets its start in life. Even when deep snows mean the calves are born on Canada side, the mothers will bring their calves to the coastal plain as soon as they can. We call it "Izhik Gwats'an Gwandaii Goodlit" -- the Sacred Place Where Life Begins." La station de ski Arizona Snowbowl a commencé à profaner le site sacré des San Francisco Peaks avec de la neige faite d’eau d’égouts mardi 13 novembre, malgré les protestations et les affaires en justice. Les Pics San Francisco sont sacrés pour 13 Nations Autochtones de la région et les hommes médecine y conduisent des cérémonies de guérison et y cueillent des plantes médicinales. Un appel à un boycott international de la station Arizona Snowbowl et des commerces de Flagstaff est lancé, vu qu’ils ont poussé à transformer les Pics sacrés en terrain de jeu pour des imbéciles. Au lieu de préserver les cultures des Autochtones, qui sont mises en scène et exploitées dans toute la ville de Flagstaff, la municipalité a poussé à la profanation et aux profits financiers de l’homme d’affaires de Scottsdale propriétaire de la station. Les médias aussi ont joué un rôle dans la profanation, entre autres l’Arizona Daily Sun, qui a toujours refusé de relater selon l’éthique les nombreuses protestations et les actions en justice contre l’utilisation d’eau d’égouts pour le projet de neige artificielle. Une bonne part de forêt ancienne a également été détruite pour faire passer la tuyauterie. In all of these cases, the media is held responsible for failing its ethical duty to report the facts. The media, too, has become a playground of fools.